Just in time for those long summer evenings, may we introduce to you the latest expression from the creative mind of Mr Wheadon: Yuzu, lemongrass and green tea gin. 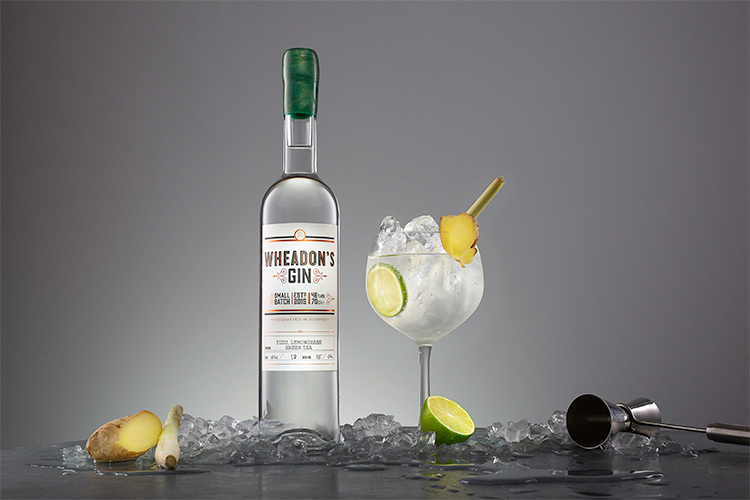 This third addition to the Wheadon’s Gin family has several similarities to its siblings; it too is designed first and foremost as an exceptional gin & tonic gin, and it also features a locally sourced botanical in the form of locally grown lemongrass raised in one of Guernsey’s iconic glasshouses. The wax that seals the cap of each bottle is dark green with gold flecks, in reference to the colour palette of the lemongrass and green tea elements. The headline botanical yuzu (Citrus junos) is an aromatic yellow citrus fruit from the Far East, most often associated with Japanese cuisine. It originated in central China and Tibet (and is a distant descendent of the mandarin orange), but was introduced to Korea and then Japan during the Tang Dynasty (618-907 A.D.) where it was cultivated as an ingredient. Yuzu look like small, yellow, grapefruit with uneven skin. We use the peel, which has a fragrant lime flavour that is higher than that of tangerine, and provides a “quick” opening flavour. The lemongrass that we use is grown locally by Joyce Hardy in the glasshouses of the Marette Du Haute Vinery in St Sampsons, Guernsey. Joyce also raises the mandarin limes that feature in our mandarin lime and hibiscus expression, and we are proud to once again be able to feature a locally sourced botanical in our latest gin. Lemongrass provides a soft and almost sweet lemon flavour, but without the tartness of citrus, making it a fantastic transition flavour. Chinese sencha green tea is a green tea that originates from (and is enormously popular in) Japan, but that is grown and processed in China. The Japanese technique of steaming the leaves for 15-20 seconds is used to prevent oxidization, before the leaves are rolled, dried, and sorted. Sencha green tea has a light, fresh and savoury flavour, and when made as tea has a golden green colour – the inspiration for the colour of the wax seals on the bottles of this expression. The palate leads with a high citrus note of yuzu, which gives in to the lower, longer, length of flavour of lemongrass. The lemongrass carries the yuzu flavour through to a touch of rose, before the herbaceous botanical of green tea takes over. The overall effect is a long flavour profile that softens over time, taking the drinker from high citrus notes through to lower herbaceous elements. We recommend enjoying Wheadon’s yuzu, lemongrass and green tea gin with premium Indian tonic water over ice, garnished with a muddled raspberry or a slice of fresh ginger. It also works really well paired with ginger ale and a slice of fresh lime. Wheadon’s yuzu, lemongrass and green tea gin is now being poured in bars and restaurants across the Channel Islands and at select properties on the British mainland. Bottles can be purchased from Guernsey’s Bella Luce Hotel (why not stay for one of our “Gintroduction” tasting sessions?! ), various off-licenses across the Channel Islands and duty free on all Aurigny flights. Full details of Wheadon’s Gin stockists can be found by clicking here.